We’re trying something new. This is the place where you can order film related merchandise, and aside from getting Raymond Scott related stuff which we think is pretty cool (and hope you will too), it’s another way you can support the film, and help spread the word. Click here to go to the store. 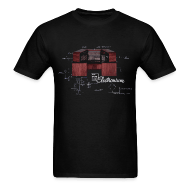 We’ve got a men’s and woman’s Electronium T-Shirt and a simple but eloquent “powerhouse b” shirt, plus a T-shirt for the film and more, including a mug so you can have a cup of something with Raymond Scott. Again, Click here to go to the store and thanks! I’d love to have a poster of the Electronium shirt design. please please please do a book of them.